Halloweenspire is a free app to get Halloween inspiration. Get Halloween home/party decor &amp; food ideas, Halloween kids costume and makeup ideas, Halloween makeup ideas for adults and lots more cool Halloween stuff for everyone. We have listed high quality images for you to take Halloween inspiration and ideas from. Get inspired this Halloween and make the best out of our free Halloween inspiration app with just a click. This free Halloween app has lots of cool image inspiration for everyone who loves to celebrate Halloween with family and friends. 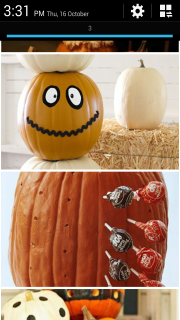 Make spooky home decor, cook delicious Halloween food to serve those looking for Trick or Treat. Get awesome Halloween makeup ideas and find a variety of cool things you can do this Halloween 2014. Not only this but you can also get funny ideas to get kids and babies dressed up in Halloween costumes. Enjoy Halloween with our free awesome Halloween inspiration app. Unbreakable Samsung Galaxy S4 ..